Attila (1846) by Giuseppe Verdi is early Verdi and was composed after Ernani and immediately before Macbeth. David Gockley and Nicola Luisotti seem to have effectively banished the San Francisco Verdi curse I used to complain about all the time. What we needed was a real Italian conductor, one who understands the rhythmic requirements, the vocal requirements for the singers, and the requirement that he aid them in their relationship to the orchestra. Sometimes the orchestra can be loud, and other times it has to be soft. Luisotti understands this. In the act break traditionally the conductor asks the orchestra to stand so the audience can applaud them, but this time in the last performance of this opera for this season they refused to stand and sat clapping for the maestro. At the end of the opera he made the rounds of the first row string players and hugged each one in turn. I liked the romantic couple, shown at top, both in their San Francisco Opera debuts, sung by Lucrecia Garcia as Odabella and Diego Torre as Foresta. Feruccio Furlanetto was a wonder. I simply adore him. But I must reserve my biggest accolades for Quinn Kelsey in the role of Ezio, shown with Furlanetto in the picture above. 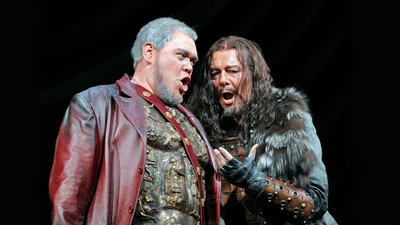 He was a Merolini in the not too distant past and has blossomed into an incredible baritone. I would definitely like to hear more of him. There isn't a lot of historical accuracy in this opera. The Huns were from Asia and probably didn't worship Odin. Attila didn't overrun Rome because there was a severe drought in Italy that year, and the Huns fled back to their homeland. Attila died after that. Stuff like that. Instead we get religious fluff, and a lot of ambiguity in the lead character's personality. The sets enhanced the drama. We were treated to collapsing theaters in three different eras. I don't know what sense this makes, but the structures were pleasing. In the modern scene the movie "Sign of the Pagan" starring Jack Palance as Attila played in the background without sound. I know that all over Italy are destroyed historical theaters. Just recently I was reading in the New York Times about the Palazzo Bardi being converted into apartments, including the theater that's inside where the Florentine Camerata first staged their operas. The new owners have tried to keep the structure of the theater in tact while making it into an apartment. Especially musically, this was excellent Verdi.